This past weekend I had the chance to try ZEN Green Tea Liqueur, a new product from Japan's Suntory. By fortuitous chance, I had some friends over that day, and so we all sat around the table and put ZEN through its paces. This was a demanding and opinionated crowd, but the overall consensus was a big "thumbs up." "This is the taste of Japan," said one person after the first sip. Another first impression was that ZEN has "an unexpected, original bouquet." Another friend said it was smooth, sweet and flavorful, like a "Japanese Drambuie." 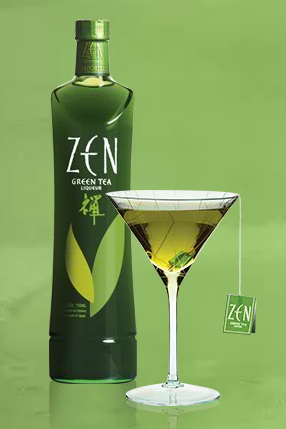 ZEN has a hint of liquorice; the green tea earthiness is subdued but definitely present. The texture also has a subtle, almost undetectably light matcha-like graininess, which gives it a slight chewiness (if that makes any sense). The bottle of ZEN came with a small booklet tagged to the neck. Of the recipes inside, we tried the Zentini, although we made it first with just ZEN and vodka — and it was excellent. In fact, for those who aren't partial to sweet liqueurs, the Zentini tones down the sweetness but without sacrificing the unique green tea flavor. After further experimentation, we concluded that a Zentini on the rocks but sans orange juice was the ultimate. Unfortunately, we depleted our supply of ZEN before we could do further experimentation with other recipes. So let this be a warning: If you serve ZEN at a party, be sure to get your share quickly, because it is sure to disappear quickly. Finally, the bottle and labeling are also top-notch super-classy, making ZEN a fine gift idea — for, say, Mother's Day or Monk's Day (hint, hint).